Kevin Hall, Durango's Development Manager for Parks, Open Space and Trails, sits with Trails 2000 Director Mary Monroe and La Plata County Manager Shawn Nau at the meeting at Fort Lewis College. Photograph by Eirik White. Hosted by the Appleseed Series and the Sustainability Alliance, the event at Fort Lewis College gathered a variety of experts focusing on local sustainability. Panelists including County Manager Shawn Nau, Parks, Open Space and Trails Development Manager Kevin Hall, Trails 2000 Director Mary Monroe, and students Chad Goodale and James Foerster, who have studied the issue extensively, all spoke about the open space and transportation issues at hand surrounding Horse Gulch. Working to moderate the discussion was Professor Brad Clark, who opened the meeting with his own perspective on smart growth. Speaking in favor of the Grandview connection, County Manager Shawn Nau reiterated his concern that if the 35-acre parcels on Ewing Mesa were sold off, it would be next to impossible to secure the connecting road easement. He also said that a Grandview connection would provide incentive for the developer to abandon the 35-acre parcels and seek out higher density parcels, which would then be focused along the Ewing Mesa road. Further, Nau said, the Grandview connection would provide an alternative ingress route to the hospital in the event that a hazardous spill on US 160 shut the entire highway down. Kevin Hall, the development manager for parks, open space and trails, spoke about how community interest has shaped the preservation of open space parcels in the Horse Gulch area through sales tax revenues and also through grants from Greater Outdoors Colorado. Highlighting the happiness that trails bring to the lives of Durangoans, Trails 2000 Director Mary Monroe gave some background of how property and easements were secured for their construction and preservation, especially the most recent easement along Raiders Ridge and leading up to it from the north. “But when you think about Horse Gulch, and you talk about it as our central park of New York, if you think about it, there’s not one sign that says entering Horse Gulch,” she said. A student who studied the Horse Gulch in Brad Clark’s, Chad Goodale, an Environmental Studies Major at FLC, gave thought to preserving Horse Gulch through a means other than outright purchasing. Goodale studied three historical features of the Gulch, which included the Horse Gulch Road, the Telegraph line poles extending up towards Telegraph pass, and the Cummins Family Quarry. Goodale talked about his ongoing efforts to get the quarry on the Colorado State Register of Historic Properties, which could occur after an FLC official signs a finalizing document. Working to study the City and County’s 2030 TRIP Report in Brad Clark’s class was James Foerster, who is also an Environmental Studies Major. High Lama Lane resident and Mercy Regional Medical Center’s Emergency Services Director, Paul Gibson, attended the meeting, saying that the idea of having the road as a bypass to the hospital in the event of a hazardous materials shutdown of US 160 doesn’t make sense to emergency service providers, given that the argument could be used for building a road anywhere. It would be more relevant to argue for the road based on the need to support the development, since that’s what the road’s main purpose would serve, he said. Nau responded, saying that the County’s Emergency Services Director disagrees with this notion, while saying that the main logic behind the road is to relieve congestion on the US 160 Corridor. Later, a comment from Laurie Gibson, while looking at the map of the proposed road on the projector screen, said it was not a logical proposal for a shortcut as easier access to the hospital. This brought chuckles and laughter from the audience. “Then again, the road alignment may change,” Nau responded. 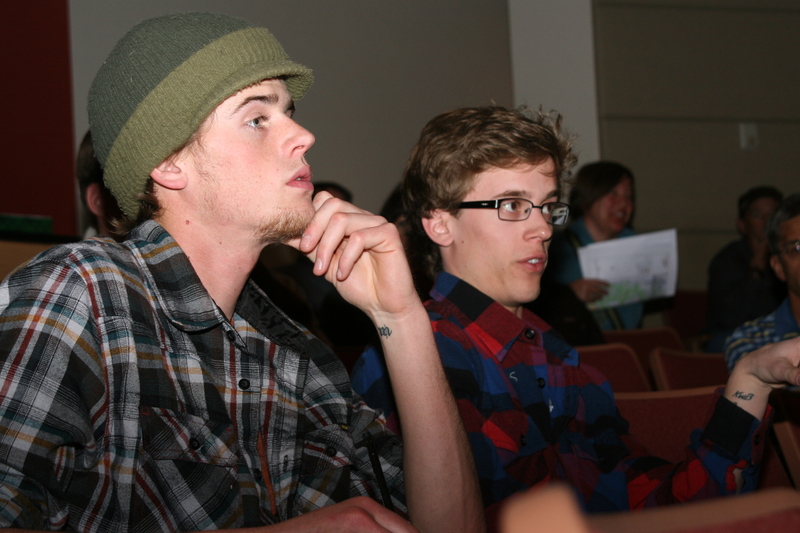 Students listen to speakers at the meeting on open space preservation efforts for Horse Gulch and Ewing Mesa. Photograph by Eirik White. Responding to Amy, Nau said that the 2030 Trip Report was drafted as part of a public process, and secondly that a future contract between the county and Oakridge Energy would be drafted and later brought to a meeting where public comments could be given and the contract later amended. A member of Earth First! Durango, Travis, asked Nau if it could be guaranteed that in the event of the Grandview connection going in, that Oakridge Energy would simultaneously abandon the 35-acre parcels and seek out higher density parcels focussed along the Ewing Mesa Road as a result. Such an outcome would depend on whether it was worded that way in the final contract between La Plata County and Oakridge Energy, Nau said. Wrapping up the meeting, Riley Neugebauer, the event co-organizer from the Durango Youth Coalition, thanked the speakers who attended. Feeling empathy for the public officials involved, she was grateful, considering that most of the time when people want to give input, it’s because they’re mad, it’s not because they want to say thanks. I appreciate your steadfast attention to this matter. I also enjoy reading your blog. Keep up the good work. Writing about this issue helps me to articulate my reasoning and arguments, even if I’m not the most charismatic speaker. Plus, I think putting the information out there helps people understand this complex issue a little better. I’m glad you get something out of it. Thanks for moderating the series last night. Paul Gibson has a good point. Although I understand the proposed road could serve as an alternate route to the hospital, it’s questionable if it could ever be made a “shortcut” and continuing to espouse this theory does seem like a scare tactic. They’ve spent too much time talking about hypothetical “what if’s”. Road proposers need to be clear and honest about why they want this road in the first place. What Paul Gibson said about the county’s scare tactics applies to what politicians have been doing since the beginning of humans using political tactics. When they cannot rule the populace through the gaining of respect for their ideas, they resort to fear tactics. But the same can be used by activists against them–it’s a two-way street.